Sweet dreams are part of every family vacation, and the incredible rooms and suites at the Beaches Turks and Caicos resort are designed to make them all come true. Even the smallest detail has been considered, from the rich fabrics and soft pillows, to mahogany furnishings and state-of-the-art technologies. It all adds up to accommodations that offer unrivaled luxury, supreme comfort, and dedicated service—and some of our top categories even include a personal butler. Choose from over two dozen different room categories, from oceanview rooms and suites, to quaint villas in sun-washed colors. At this resort, dreams come true every day and night. 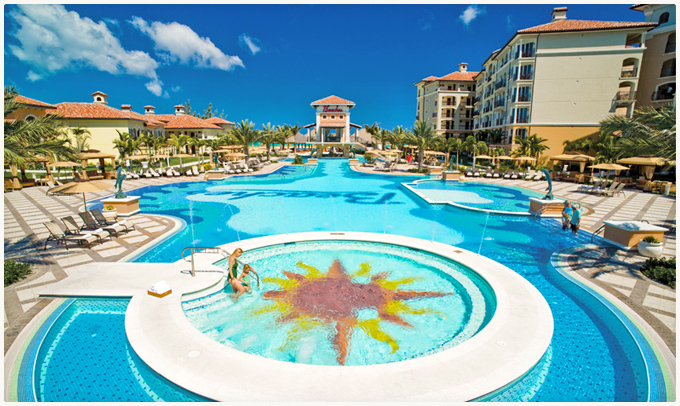 An all-inclusive family vacation at the Six Star Diamond Award-winning Italian Village. Linger over great food and conversation at an Italian restaurant. Stroll along the piazza for some leisurely shopping. The sprawling pool just steps from the beach is big enough to float a gondola across. Everything here has an Italian flavor, from the fountains and statues to the cuisine. It’s like staying on the Italian Riviera, but with a decidedly Caribbean twist. Opening out directly onto the powdery white-sand beach from its two over-sized patios, this suite features a king size mahogany, four-poster bed, adorned with a plush duvet, twin daybed with trundle and lounge sleeping chair. 42" flat screen TV plus a bar area with its own refrigerator and microwave. Kids enjoy mahogany bunk beds with a trundle; a 27" flat screen TV with a state-of-the-art XBOX360®; a multi-function game table; a built-in, nautical, mahogany storage wall unit; its own closet; and a vanity unit with basin and mirror. Bathroom hosts a two-basin mahogany vanity with a wall-mount makeup mirror and hair dryer; a whirlpool tub; a separate rainhead shower; and a private water closet. Connecting doors lead into living room with its daybed and trundle, sleeper sofa, cocktail table, lounge chair, desk, 42" flat screen TV, oval dining table with seating for six, wet bar, butler's pantry with refrigerator and microwave, full closet and bathroom. Showcasing a direct, magnificent, panoramic view of the Caribbean Sea, this suite features a king size mahogany, four-poster bed, adorned with a plush duvet, twin daybed with trundle and lounge sleeping chair. 42" flat screen TV plus a bar area with its own refrigerator and microwave. Kids enjoy mahogany bunk beds with a trundle; a 27" flat screen TV with a state-of-the-art XBOX®; a multi-function game table; a built-in, nautical, mahogany storage wall unit; its own closet; and a vanity unit with basin and mirror. Bathroom hosts a two-basin mahogany vanity with a wall-mount makeup mirror and hair dryer; a whirlpool tub; a separate rainhead shower; and a private water closet. Connecting doors lead into living room with its daybed and trundle, sleeper sofa, cocktail table, lounge chair, desk, 42" flat screen TV, oval dining table with seating for six, wet bar, butler's pantry with refrigerator and microwave, full closet and bathroom. Featuring king size mahogany, four-poster bed, adorned with a plush duvet, twin daybed with trundle and lounge sleeping chair. 42" flat screen TV plus a bar area with its own refrigerator and microwave. Kids enjoy mahogany bunk beds with a trundle; a 27" flat screen TV with a state-of-the-art XBOX®; a multi-function game table; a built-in, nautical, mahogany storage wall unit; its own closet; and a vanity unit with basin and mirror. Bathroom hosts a two-basin mahogany vanity with a wall-mount makeup mirror and hair dryer; a whirlpool tub; a separate rainhead shower; and a private water closet. Connecting doors lead into living room with its daybed and trundle, sleeper sofa, cocktail table, lounge chair, desk, 42" flat screen TV, oval dining table with seating for six, wet bar, butler's pantry with refrigerator and microwave, full closet and bathroom. Featuring king size mahogany, four poster bed, adorned with a plush duvet, lounge sleeping chair. 42" flat screen TV plus a bar area with its own refrigerator and microwave. Kids enjoy mahogany bunk beds with a trundle; a 27" flat screen TV with a state-of-the-art XBOX®; a multi-function game table; a built-in, nautical, mahogany storage wall unit; its own closet; and a vanity unit with basin and mirror. Bathroom hosts a two-basin mahogany vanity with a wall-mount makeup mirror and hair dryer; a whirlpool tub; a separate rainhead shower; and a private water closet. Connecting doors lead into living room with its daybed and trundle, sleeper sofa, cocktail table, lounge chair, desk, 42" flat screen TV, oval dining table with seating for six, wet bar, butler's pantry with refrigerator and microwave, full closet and bathroom. Two bedroom suite features a master bedroom with a king size, mahogany, four poster bed, twin daybed with trundle for two guests, 42" flat screen TV, bar with refrigerator and microwave. Separate kids room with a mahogany bunk bed with a trundle; a 27" flat screen TV; a game table; mahogany storage wall unit; its own closet; and a vanity unit with basin and mirror. Bathroom boasts polished Carrara marble; a two-basin mahogany vanity with a wall-mount makeup mirror and hair dryer; a whirlpool tub; a separate rainhead shower; and private water closet. Living room with daybed and trundle, sleeper sofa, cocktail table, lounge chair, desk, 42" flat screen TV, oval dining table for six, wet bar with granite top, butler's pantry with refrigerator and microwave, full closet and splendid bathroom. Two bedroom suite features a master bedroom with king size, mahogany, four-poster bed, lounge sleeping chair for guest, 42" flat screen TV, bar area with refrigerator and microwave. Separate kids room with a mahogany bunk bed with a trundle; a 27" flat screen TV and game table. Bathroom boasts polished Carrara marble; a two-basin mahogany vanity with a wall-mount makeup mirror and hair dryer; a whirlpool tub; a separate rainhead shower; and a private water closet. Living room with daybed and trundle, sleeper sofa, cocktail table, lounge chair, desk, 42" flat screen TV, oval dining table with seating for six, wet bar with granite top, butler's pantry with refrigerator and microwave, full closet and splendid bathroom. Two bedroom suite features a master bedroom with king size, mahogany, four poster bed, lounge sleeping chair for guest, 42" flat screen TV, bar area with refrigerator and microwave. Separate kids room with a mahogany bunk bed with a trundle; a 27" flat screen TV and game table; storage wall unit; its own closet; and a vanity unit with basin and mirror. Carrara marble in bathroom; two-basin mahogany vanity with wall-mount makeup mirror and hair dryer; whirlpool tub; separate rainhead shower; and private water closet. Living room features a daybed and trundle, sleeper sofa, cocktail table, lounge chair, desk, 42" flat screen TV, oval dining table with seating for six, wet bar with granite top, butler's pantry with refrigerator and microwave, full closet and bathroom. Suite features a master bedroom complete with a king size, mahogany, four-poster bed, a 42" flat screen TV, a bar area with its own refrigerator and microwave. In addition, a twin daybed with trundle and sleeper chair for three guests. Separate kids room complete with a mahogany bunk bed with a trundle; a 27" flat screen TV; game table; a built-in, nautical, mahogany storage wall unit; its own closet; and a vanity unit with basin and mirror. Bathroom boasts polished Carrara marble; a two-basin mahogany vanity with a wall-mount makeup mirror and hair dryer; a whirlpool tub; a separate rainhead shower; and a private water closet. This suite features a master bedroom with a king size, mahogany, four poster bed, a 42" flat screen TV, a bar area with its own refrigerator and microwave. In addition, a twin daybed with trundle and sleeper chair for three guests. Kids have their own room with a mahogany bunk bed with a trundle; a 27" flat screen TV; game table; a vanity unit with basin and mirror. Bathroom boasts polished Carrara marble; a two-basin mahogany vanity with a wall-mount makeup mirror and hair dryer; a whirlpool tub; a separate rainhead shower; and a private water closet. This suite features a master bedroom with a king size, mahogany, four poster bed, a 42" flat screen TV, a bar area with its own refrigerator and microwave. In addition, a twin daybed with trundle and sleeper chair for three guests. A separate kid's room with a mahogany bunk bed with a trundle; a 27" flat screen TV; game table; a vanity unit with basin and mirror. Bathroom boasts Carrara marble; a two-basin mahogany vanity with a makeup mirror and hair dryer; a whirlpool tub with a marble deck; a separate rainhead shower; and a private water closet. This suite features master bedroom with a king size mahogany four poster bed, a 42" flat screen TV and a bar area with its own refrigerator and microwave. Lounge sleeping chair for extra guest. A separate kid's room with a mahogany bunk bed with a trundle; a 27" flat screen TV; game table; a vanity unit with basin and mirror. Bathroom features polished Carrara marble; a two-basin mahogany vanity with a wall-mount makeup mirror and hair dryer; a whirlpool tub; a separate rainhead shower; and a private water closet. This suite features a master bedroom with a king size, mahogany, four poster bed, a 42" flat screen TV and a bar area with its own refrigerator and microwave. In addition, a twin daybed with trundle for two extra guests. Separate kid's room complete with a mahogany bunk bed with a trundle; a 27" flat screen TV; a multi-function game table; a vanity unit with basin and mirror. Bathroom boasts polished Carrara marble; a two-basin mahogany vanity with a makeup mirror and hair dryer; a whirlpool tub; a separate rainhead shower; and a private water closet. This suite features a master bedroom with a king size mahogany, four poster bed, a 42" flat screen TV and a bar with its own refrigerator and microwave. Lounge sleeping chair for guest. Separate kid's room with a mahogany bunk bed with a trundle; a 27" flat screen TV; a game table; a vanity unit with basin and mirror. Bathroom boasts polished Carrara marble; a two-basin mahogany vanity with a wall-mount makeup mirror and hair dryer; a whirlpool tub; a separate rainhead shower with; and a private water closet. This suite features a master bedroom with a king size, mahogany, four-poster bed, a 42" flat screen TV and bar with refrigerator and microwave. Lounge sleeping chair for guest. Separate kid's room with a mahogany bunk bed with a trundle; a 27" flat screen TV; a game table; and a vanity unit with basin and mirror. Bathroom boasts polished Carrara marble; a two-basin vanity with a makeup mirror and hair dryer; a whirlpool tub; a separate rainhead shower; and a private water closet. True to Beaches' standards of luxury, Key West Village boasts luxurious and spacious accommodations. The 168 rooms include expansives studios, 1 & 2 bedroom suites, as well as 3 and 4 bedroom stunning villas. The new Key West Village introduces an unparalleled level of elegance to the easy-going rhythms of the islands with stunning beachfront villas and expansive suites ideal for multi-generational family travel. 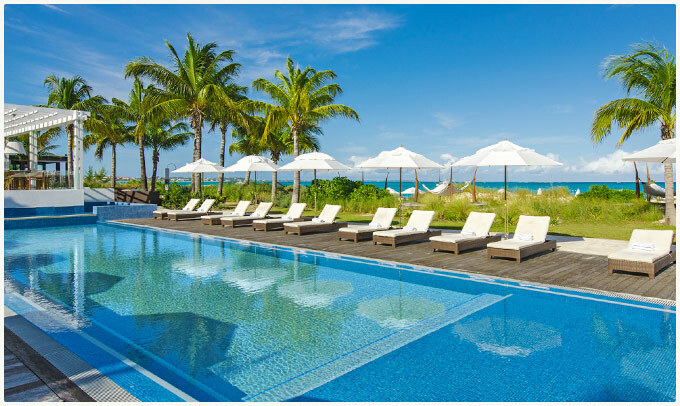 Situated on an enviable stretch of world-renowned Grace Bay, a sleek oceanfront pool and chic beachfront fire-feature lounge area allow you to enjoy the carefree lifestyle of The Florida Keys amidst the breathtaking beauty of Turks & Caicos. These villas are individual homes situated directly on the beach. Each villa has three floors. The first floor has a full kitchen with state of the art appliances and granite countertops, a fully furnished living room with sofa, chairs and a flat screen TV and dining room that can easily accommodate six people. There is also a bedroom with hardwood floors and flat screen TV. The bathroom features a combination tub, shower, and granite vanity. The second floor boasts the master bedroom with hard wood floors, flat screen TV and walk-in closet. The master bath features an oversized jetted soak tub and granite vanity. Third and fourth bedrooms are also on the second floor and feature hard wood floors and flat screen TV's. The bathrooms have combination tub and showers with granite vanities. The third floor boasts a comfortable sunroom or private patio overlooking the beach and ocean. Outside, there is a large porch, covered dry area and a private pool. Villa includes butler service. You will feel like you are in a private residence in these spacious villas. Each villa has three floors. The first floor has a full kitchen with state of the art appliances and granite countertops, a fully furnished living room with sofa, chairs and a flat screen TV and dining room that can easily accommodate six people. There is also a bedroom with hardwood floors and flat screen TV. The bathroom features a combination tub, shower, and granite vanity. The second floor boasts the master bedroom with hard wood floors, flat screen TV and walk-in closet. The master bath features an oversized jetted soak tub and granite vanity. Third and fourth bedrooms are also on the second floor and feature hard wood floors and flat screen TV's. The bathroom has combination tub and showers with granite vanities. There is also a sunroom and deck. Villa includes butler service. You will feel like you are in a private residence in these spacious villas. Each villa has three floors. The first floor has a full kitchen with state of the art appliances and granite countertops, a fully furnished living room with sofa, chairs and a flat screen TV and dining room that can easily accommodate six people. There is also a bedroom with flat screen TV. The bathroom features a combination tub, shower, and granite vanity. The second floor boasts the master bedroom with flat screen TV and walk-in closet. The master bath features an oversized jetted soak tub and granite vanity. The third and fourth bedrooms are also on the second and third floor and feature flat screen TV's. The bathrooms have combination tub and showers with granite vanities. Villa includes butler service. These spacious villas are so large you will feel like you are in a private home. Each villa is three stories. The first floor boasts a full living room, dining room and full kitchen with state of the art stainless steel appliances. There is also a breakfast nook as well as a bedroom equipped with a combination tub and shower bathroom. The master bedroom is on the second floor and features hard wood floors and a flat screen TV. Large bathrooms have oversized tubs and granite counters. The third bedroom also has hardwood floors and a bathroom with combination tub and shower. The third floor has either an outdoor relaxation area or sunroom. All bedrooms boast king sized beds. Villa includes butler service. These spacious villas are so large you will feel like you are in a private home. Each villa is three stories. The first floor boasts a full living room, dining room and full kitchen with state of the art stainless steel appliances. There is also a breakfast nook as well as a bedroom equipped with a combination tub and shower bathroom. The master bedroom is on the second floor and features hard wood floors and a flat screen TV. Large bathrooms have oversized tubs and granite counters. The third bedroom also has hardwood floors and a bathroom with combination tub and shower. All bedrooms feature king size beds. The third floor has either an outdoor relaxation area or sunroom. Includes concierge service. These suites have rich furnishings representing Key West. The living room and dining room with a breakfast nook feature a fully equipped kitchen with stainless steel, state of the art appliances, a large flat screen TV and a dining table for 4. Bedrooms feature a king size bed and a flat screen TV. The two bathrooms come equipped with a combination tub, shower and granite counters. The suites are two story and some feature a spiral staircase. Suites also boast a balcony. Includes concierge service. These spacious one story, two bedroom suites have rich furnishings representing Key West and Cape Cod. Each suite features two bedrooms with king sized beds and flat screen TV's. Two bathrooms feature a combination tub & shower with granite vanities. The large living and dining area features a flat screen TV, dining table and fully equipped kitchen with state of the art stainless steel appliances and granite countertops. The suite also boasts a terrace. Includes concierge service. This one bedroom suite features a master bedroom with luxurious furnishings representing Cape Cod and Key West. Each suite comes with a fully equipped kitchen with state of the art stainless steel appliances and granite countertops. There is a large living room with flat screen TV and dining table. The master bedroom has a king sized bed and flat screen TV. The bathroom includes a shower with granite vanity. The suite also features a large balcony with beautiful ocean views. Includes concierge service. This one bedroom suite features a master bedroom with luxurious furnishings representing Key West. Each suite comes with a fully equipped kitchen with state of the art stainless steel appliances and granite countertops. There is a large living room with flat screen TV and dining table. The master bedroom has a king sized bed and flat screen TV. The bathroom includes a shower with granite vanity. The suite also features a large balcony. Includes concierge service. One bedroom suite features a master bedroom with luxurious cottage style furnishings representing Key West. Bedroom has a king sized bed and flat screen TV. Bathroom has a combination tub & shower with granite vanity. The living area features a dining table, trundle, flat screen TV and fully-equipped kitchen with state of the art stainless steel appliances. There is also a cozy terrace. Includes concierge service. A very large room with a sitting area that includes a trundle day bed with dining table and wet bar. The room is beautifully decorated with marble tile floors. All rooms have a king bed and flat screen TV with spacious bathrooms with a shower and single vanity. All rooms have a patio or balcony. Includes concierge service. Spacious and beautifully decorated rooms with marble tile floors, which step out to a balcony or patio. All rooms have a flat screen TV and spacious bathrooms with a shower and single vanity. Includes concierge service. Picturesque gardens teaming with colorful vegetation. White-sand beaches perfectly suited to watching the tide roll in. This is what life is like in the Caribbean, and it’s exactly what you’ll find on an all-inclusive family vacation at the Caribbean Village at Beaches Turks & Caicos. Find yourself a quiet little spot on a shaded hammock and read a book. Sample some savory cuisine at Arizona’s, Reflections and Schooners. Send your kids to Camp Sesame while you relax around the pool. Real life in the Caribbean doesn’t get much better than this. 2 Delightfully relaxing pools, both with swim up bars and surrounded by lush tropical gardens. One bedroom is king bedded and the second has two doubles. Each of these rooms has a full bath with a Roman tub. Living room has a double pull out sofa and kitchenette. Crib and rollaway are available. Suites are only a short walk from the beach, Cascades and Iguana pools. Centrally located, close to everything. Two full bathrooms. All rooms with connecting and closing doors with separate entrances. This is a one-of-a-kind one bedroom suite, which features a full living room, formal dining area, full kitchen, bedroom with a king bed. This suite also carries two queen size sofa beds. The master bathroom has a bidet and whirlpool. Crib and/or rollaway bed available. This suite has a large balcony. Located on the third floor of the East Wing of the main building. These lavish suites feature a Mahogany king size bed with a parlor and trundle bed plus suite concierge service. The suite has one walk-in shower with a Roman tub. All suites have a patio or balcony with views of the gardens, resort grounds and a few have views of Cascade pool or an ocean view. Suites are located on floors one through three in the Salt Cay Villas. These lavish suites feature mahogany king size beds and living area with trundle. The suites have one walk in shower with roman tub. All of these suites have either patio or balcony. The entire suite is tiled and the bedrooms feature a mahogany four-poster king bed and a bath with a whirlpool and walk in shower. The parlor has a Trundle Bed. Ground floor suites have a patio and second floor suites a balcony. These exciting rooms feature either a king bed with a double pullout sofa or double beds with a single sleep chair. Both room configurations have a large full bath. Cribs and rollaway can be accommodated. All rooms have balconies. These rooms are tiled and feature either Mahogany king bed with a double pull-out sofa or two Mahogany double beds with a single sleep chair. Both room types have a large full bath and balcony. The rooms are located on the first floor of the Main building with views of the pool or gardens. All rooms have patios. Located on the first floor of the East and West wings of the main building. These rooms feature a mahogany king bed with a double pullout sofa and a large full bath. Cribs and rollaway can be accommodated. All rooms have patios. Located on the second floor of the East and West wings of the main building. These rooms are fully tiled and feature a mahogany king bed with a trundle bed. Rooms have a large full bath. Cribs and rollways can be accommodated. All rooms have balconies. Room View: Resort Grounds, Pool or Garden; 2nd floor, East & West wing, Main Building. As you stroll through the village, on your right is a charming chateau and a pool that seems straight from a fantasy. On the “left bank” is a cypress-lined boulevard with chic restaurants and cafés. An all-inclusive family vacation in our French Village is like stepping into a lush garden at Versailles, only with a half-acre pool and a swim-up bar. And that French palace never had an expansive waterpark like the one you’ll find here. It’s all included, so you can have your cake (from the Café de Paris) and eat it too. Each room in this three bedroom suite could be configured to have king size four-poster beds with double pull out sofas or double beds with a single pull out sofa. Rooms feature a large living/dining room and four full bathrooms. All rooms connect and they each have their own private entrance. First floor suites have small patios and third floor suites have French balconets. Please refer to the French Village Three Bedroom Suite description. This is the same suite less one bedroom. Thus, this suite has one king bedroom with a double pull out sofa, a second bedroom with double beds, a single sleeper chair and a living area. Suites have small patio or French balconet. This one bedroom suite has the same living area as the two and three bedroom French Village Suites. The option is either a bedroom with a king four-poster bed and a double pull out sofa, or double bed bedroom with a single sleep chair. Living area has a patio or French balconet. Located on the first floor, this room features either a mahogany king size bed and a twin daybed with trundle or two double beds with a single sleeper chair, a large full bath and a patio. The room offers views of the lush gardens, aquamarine pool and courtyard of the French Village. Rooms are tiled and feature a full bath and Mahogany king sized bed with one twin day bed with trundle or double beds with a single sleep chair. Located on the second and third floors, these rooms have a balconette. All rooms are located in the French Village and offer views of the Riviera Pool or lush floral gardens. These rooms feature a mahogany king size bed with a trundle or double beds with a single sleep chair and a full bath. Second and third floors have balconet.